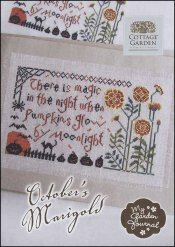 My Garden Journal: October's Marigolds [C6060] - $7.50 : Yarn Tree, Your wholesale source for cross stitch supplies. Part 10 of 12 in the My Garden Journal series by Cottage Garden Samplings. Verse reads: "There is magic in the night when pumpkins glow by moonlight". Little candy corn colored petals are blowing in the breeze above a row of glowing pumpkins. The My Garden Journal series can be stitched alone (125 w x 74 h), stitched together (379 w x 302 h), or combine them to create a scrapbook journal. Can be stitched on #8684 Belfast Linen Smokey Pearl.